There are many benefits and reasons to fine tune your running form. The first of course, is to avoid injury; after all, who wants to be benched? Secondly, to achieve maximum efficiency. When you run efficiently you can go farther faster. One of the keys to developing an efficient running form while keeping sports injuries at bay is flexibility. In addition to regular stretching (you do stretch, dont you?) you should be indulging in a dynamic warm-up routine. 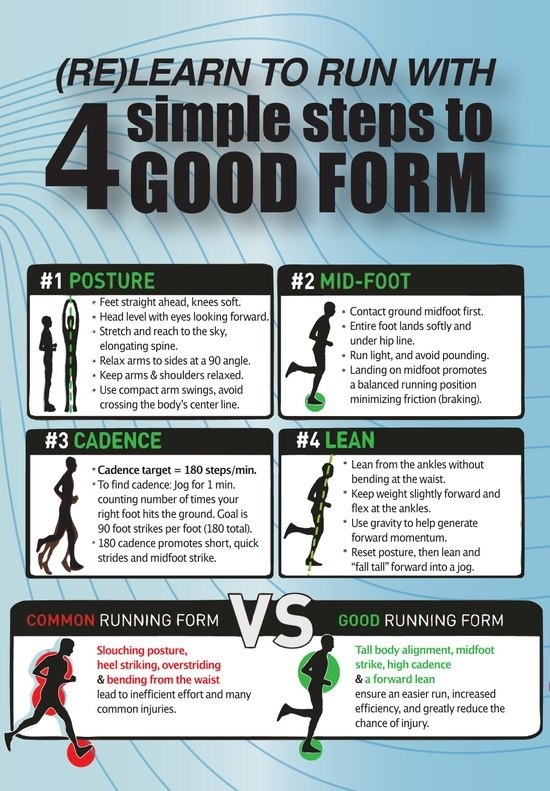 So what is good running form? The short answer is, It depends. This is obvious when you consider that everybody has their own unique set of biomechanical factors. The infographic below gives some general guidelines that apply to most people, but they are just that, guidelines. It is not uncommon to see runners leaning forward at the waist, especially late into their workout when fatigue sets in. This is a mistake on so many levels. First, it inhibits proper breathing. Without a good supply of oxygen performance will suffer and its just plain uncomfortable. One way to check yourself is to imagine a skyscraper in front of you in the distance. Now imagine that your chest is tethered to the top of the building with a rope. Kind of goofy, I know, but it works, especially towards the end of a long run when the mind wanders. Although arm swing is natural and essential to maintain balance, the angle is not. Keep your elbow bent at a 90 degree angle and your forearms parallel with the ground. Angling them up as so many runners do will introduce fatigue and tension in the shoulders and chest. It is also important to keep your hands relaxed. Keeping them tightly balled up will also result in tension. If you like to carry a water bottle (good idea) use one that has a strap that wraps around the back of your hand. That was you dont have to grip it at all. There are many opinions on how you should land. My opinion? Go with what feels normal unless you are doing something that really might lead to injury like landing way on the outside of your foot. All of us pronate or supinate to some extent but proper running shoe choice should take care of that.